The word "ranunkulyus" a bit unusual toRussian girls. While in Western countries (Britain, France, Italy) is on everyone's lips. And the reason - in the terminology. Ranunkulyusa Russian name - "buttercup garden." Do you think they had never seen either one or the other? Look closely at the flower trays and bridal bouquet - there you will find ranunkulyusy-buttercups in excess. Outwardly, they are very similar to roses or peonies, so people unfamiliar with the florist, can easily confuse them. Ranunkulyusy come in many different colors. White flower of the representatives of the family are a manifestation of the desire to win. When used in a bouquet of flowers bride, their meaning slightly softened - here they symbolize mutuality, harmony of two people getting married. The white color in itself signifies purity, innocence, sincerity. If you want to emphasize certain "sanctity" of your marriage, prefer white buttercups. Besides the classic wedding song with such colors ideal for any dress. 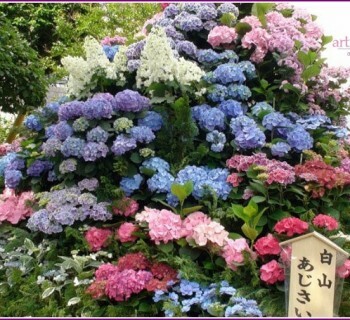 This wonderful flower has many shades: pink, purple, red, yellow. Only the blue you find you can not. Using one ranunkulyusy, florists bouquets create a variety of shapes, styles, adapting them for the weddings with all scenarios. You do not know what kind of flowers to choose for the bride's bouquet, boutonniere, bracelets, table decorations? Create the right atmosphere in the hall, which will host the grand event will help buttercups. In addition to the wedding flower arrangements, you can use them to decorate the hair of the bride and her bridesmaids, as the little presents guests. According to historical records, the word "buttercup"It comes from the word "bitter" - that in Russia called yellow poisonous ranunkulyusy. The original color of the negative of the word eventually acquired a soft, gentle tone: buttercup already does not fit with the word "bitter". But if you want to give your wedding a dynamic, bright shade, give preference to yellow ranunkulyusam. These flowers are of two types: pion-like (when the petals are concave inside, like peonies) and rose-like (resemble their appearance Roses). For those and other very large buds with soft petals and a long, thin stalks. Recent florists forced initially to strengthen the bouquet so that the stems did not break under the weight of the bud. But first allow you to create a luxury winter and spring floral arrangements, using only three - five flowers. Another advantage of these flowers in front of the other -their unique ability to stand for a long time and not fade. Although buttercups grow mainly in swampy areas or where the soil is very wet, they carry great dryness of the air, while in the bouquet, long retain their original appearance. So if you preferred the ranunkulyusam, do not worry about the bouquet, even if the wedding is not the first walking day. Buttercup is perfectly combined with many colors. If desired, simply mix a few different colors, and you get a bright catchy song. 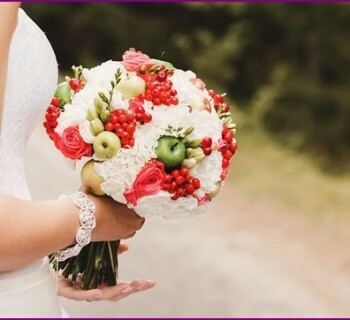 For a modest wedding bouquet (if you set out to organize the most simple ceremony) decorate with white ranunkulyusy green leaves (all green) or small flowers like lily of the valley or gypsophila. For more luxurious composition, add buttercups roses, peony, freesia, lilies, hydrangeas and hyacinths. You want to be original? Then align these flowers with calla lilies. Searching for components for a wedding bouquetchoice of brides and florists often falls on freesia - very delicate flowers. If you want to make a romantic flower arrangement using ranunkulyusy freesia and, among the latter give preference to flowers bright, pastel shades or pure white. Do not forget that the buttercups are not always self-colored. If you want to make a light, almost imperceptible flavor to your bouquet, pick bright colors who have the ends of the petals are colored purple or pink. Given the strong resemblance with buttercupsroses, a combination of these colors in a single whole in floristry it very harmonious. So, you will have a wide range of colors, shapes and sizes. Especially vivid composition happens if you combine with white roses (or yellow with pink tips of petals) and purple (or maroon) ranunkulyusy. To achieve the attention of others will help you as orange buttercups. But any other combination of shades of these colors would be suitable. 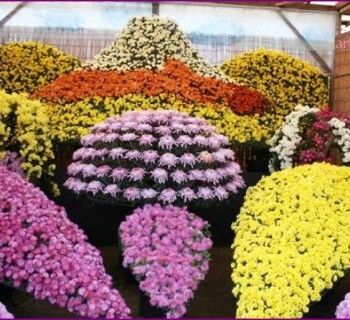 If you doubt their abilities, consult a professional florist. Buttercups are Peony-. Therefore, bouquets, which use white representatives of this type and peonies of the same color is called the florists are not mixed (when one song there are several different kinds of colors), and mono-bouquets. Inexperienced and inattentive eye can not distinguish from the buttercup peony. But the final outcome will please both in flower arranging enthusiasts and professionals who can appreciate the delicate taste of the master. A similar situation in preparation for the solemnevent does not bother to order brides wedding bouquets using (this is agreed in advance) of the two kinds of colors, not one. Qualified florist, using shades of colors, variety of shapes and colors different amounts of both types, is able to create an amazing song, perfect for any dress and wedding. If you are still in doubt whetheruse in your wedding bouquet such "strange" colors, such as ranunkulyusy, take a look at a series of photographs of floral arrangements below, in which the flowers were used. Each contains buttercups of different colors, so you can judge for yourself how well they fit with other colors and with each other.